Exception sites are sites next to a village 'envelope' which the Local Plan proposes could be used for affordable housing if a Local Needs Survey demonstrates a local need. This exception site forms a new entrance to the north of the village of Grundisburgh in Suffolk and was built in 3 phases for English Villages Housing Association (now RHT Developments). 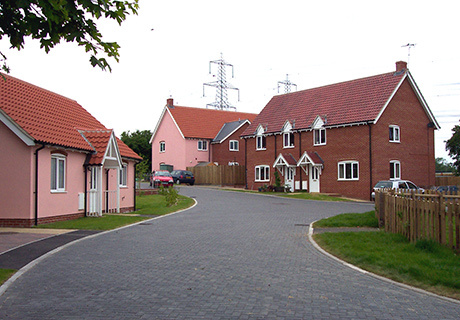 The 24 houses and flats reflect the Suffolk vernacular and are for both rental and shared ownership. The completed development was opened by HRH the Princess Royal, Patron of the Rural Housing Trust.